Choosing wall art pieces for your home can be a daunting task following your portrait session. But the result of having beautiful timeless pieces displayed in your home of your family is well worth the investment of time and money. I consider it my job to guide you through the process and ensure you end up with wall art that looks great in your space and that you are happy with. This is the first thing you should decide. I offer three styles of wall art in addition to standard glossy paper prints and framing services. Canvas prints are among the most popular ways to display images today. They have a more classic feel to them than metal or acrylic. If you have a more traditionally decorated home then you can’t go wrong with a canvas. You can hang canvas prints in the same room as traditionally framed prints and you should not have to worry about them being out of place. Canvas prints are best displayed in large sizes. Because they are about 1 1/2 inches thick, a smaller size canvas seems disproportionate. On the other hand, a large size canvas looks right at home covering an entire wall. Canvas prints also look good in sets of two or three. If you are looking to display prints in an room that has multiple windows and gets a lot of sunlight, canvas is a very good choice. The almost matte finish of canvas does better than any other material in reducing glare. These are becoming very popular and represent the future of photographic printing. Metal prints use a process of infusing dye into specially coated aluminum. This process results in very sharp images and beautifully saturated colors. These prints are resistant to water, scratches, and sun fading and do not need a frame needed. This is a more modern look and may be out of place on the same wall as traditional framed prints. So they are a great option to get started decorating a new wall or to modernize the look in your home. Metal prints are very versatile. They look equally good as an 8×10 or a 30×40. Because they show more detail than a canvas, a small size like 8×10 still works well. In fact, a cluster of smaller metal prints may be the way to go. 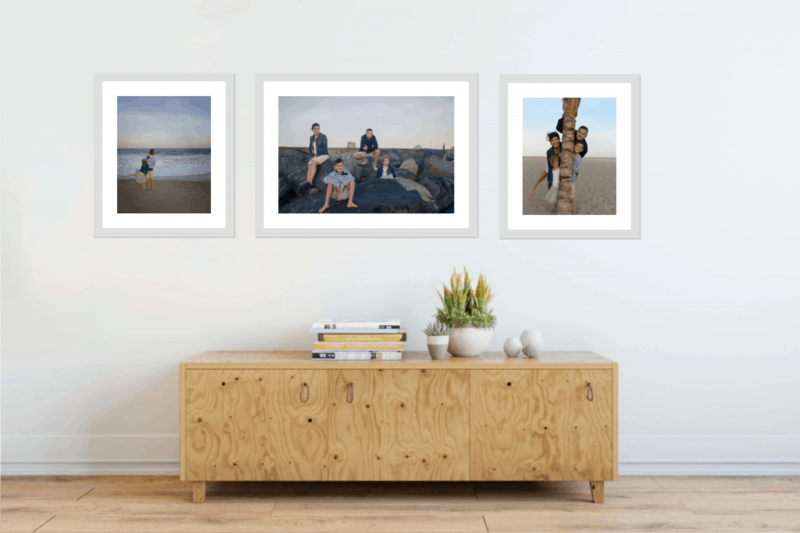 Clusters are a great solution when you have a lot of images you want to display, have a large family and want everyone to be featured on the wall, or if you want to grow your wall art collection over the years to show the growth of your family. Acrylic are the most impressive, but also the most impressive. The face of the print is mounted to clear acrylic to really make the colors pop. This is a very exciting printing process that allows colors and tones to really jump off the wall. Acrylic prints are probably the most modern looking style of wall art that I have available. They work well as clusters just like metal prints. Size is probably the most difficult aspect of selecting wall art for many people. The most important thing to consider when choosing a size is the space where the piece will be displayed. If you put a smaller piece on a large empty wall then it will look tiny and become visually overwhelmed by the size of the wall. Conversely, if you place a large piece on a small wall, it will look crowded and awkward. The way I ensure you will pick the correct size is by allowing you to see what each size looks like on your wall. I’ll take a photo of your wall either before the session or while we are looking at your images from the session. I’ll use something on the wall or place a piece of paper on the wall as a reference point for scale. Then we can use a computer to virtually place the images from your session on your wall and see exactly how each size will look on your wall. This happens at the same time as choosing the size because they go together. Many of my clients prefer to design a wall collage or cluster of images rather than a single large print for their wall. First, you can select more than one image. Sometimes picking more than one image from a portrait session can be difficult. Rather than picking one image that has the entire family in it, you can select a cluster of images with each one featuring a different family member or different groupings. One popular approach is to have one slightly larger image of the entire family surrounded by smaller images of individuals or smaller groupings. Second, a cluster of images is more easily updated. Your family will grow. Individuals change and grow up. You may want portraits in different locations and during different seasons as time goes on. If you have one large piece on the wall then you will have to take it down and replace it if you want to update it. If you have a cluster of smaller images then you can add to it or replace just a few of them at a time. Since they are smaller pieces, it will make it easier to find another location in your home for the pieces that you take down. Third, multiple smaller images more easily fit in spaces that would otherwise be difficult to place a piece of wall art. You can have a collection of images going up the stairs, shaped around other things on the wall, or even fit into smaller spaces. I’m not going to pretend that this is not factor. Wall art from a portrait session can be a significant investment. This investment is the reason it is so important to consider the factors above to make the best decision possible. Consider that a high quality piece of wall art can last for generations. Whether it is with me or somewhere else, you should ensure that you are getting long lasting high quality pieces that can be kept in the family for many many years. Investments in wall art is a decision that typically involves more than one family member. Discussing your budget ahead of time can help make the selection process easier and more enjoyable. After all, seeing your photos and selecting your favorites to display should be fun rather than stressful! Everything we already talked about already factors into making a decision regarding price. Having some ideas ahead of time will help give you a framework to understand what price range to expect. This can help you form a budget and avoid surprise. I always provide wall art pricing to my clients ahead of time so there are no surprises. With these simple steps, you will be in a great position to find exactly what you want and need for your home. You’ll end up having a piece of art hanging in your home that can be shared with multiple generations to come.